Sambong is widely regarded as herbal medicine. It is a tropical plant that grows in the wild in East and South-East Asian countries. The Sambong plant is mainly a weed by nature hence, does not need much care to grow. The herb is said to smell and taste like camphor. The Government of Philippines has recognized this herb to possess kidney cleansing properties. The leaves of the Sambong plant are used fresh or after being dried, both. Sambong was listed by the Department of Health in the Philippines as one of the 10 herbs that are effective in treating certain disorders. It is the most commonly used herb in the Philippines. Sambong is also used in Chinese and Thai folk medicines. Sambong tea is mostly used for treating kidney stones and as a cure for hypertension. Among other things, it is also considered anti-diarrheal and anti-spasmodic In addition, it cures common cold and helps in the treatment of urinary tract infections. Sambong tea is known to work as a diuretic, it induces urination and helps flush out sodium and excess fluid from the body through the urine. Thus, this herbal tea helps prevent fluid retention, too. Sambong tea, due to its unique properties as well as being a diuretic, helps lower blood pressure by removing excess sodium from the blood, which is a major component in increasing blood pressure and hypertension. Although further studies are required to prove it, Sambong tea may also help people suffering from high levels of cholesterol. At the Philippine National Kidney and Transplant Institute, the use of Sambong tea is being recommended for patients with renal (kidney) problems. Some results also pointed towards the favorable effect of Sambong in cases of kidney transplant and where patients were in the need of a dialysis, by possibly averting the condition. Sambong has recently been registered as a medicine in the Bureau of Foods and Drugs. The Department of Health in the Philippines has been promoting the use of Sambong tea to dissolve kidney stones for a while now and has even conducted clinical studies in this regard. It is also believed to aid with other disorders of the kidney. A tea made from Sambong leaves is said to act as an expectorant which will aid in getting rid of mucus and phlegm, along with curing a sore throat. It is also believed to provide relief from the common cold and fever. If you are suffering from stomach ailments like diarrhea, spasms, or pain in the stomach, drinking Sambong tea may prove to be a good treatment for these problems. Among the other uses and benefits of Sambong tea, it may act as an analgesic in patients that need relief from pain after a dental operation. 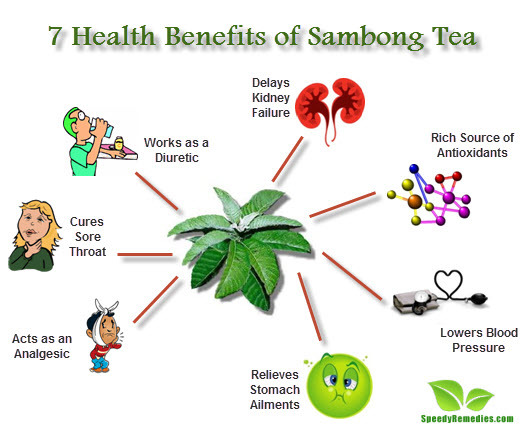 Sambong tea has flavonoids, which are pigments from a plant that act as antioxidants. Antioxidants protect our body cells and DNA from being damaged by free radicals. To make Sambong tea, you need to boil the Sambong leaves in water and let it simmer for about 10-15 minutes, prepare this tea and store it in a clean container. Drink this tea throughout the day, at least 3-4 times for maximum benefits. The smell is aromatic and pungent but also soothing at the same time. There haven’t been sufficient studies of the use of Sambong tea by pregnant women or women who are breast-feeding, hence it is better that its use be avoided in both cases. As the Sambong plant is a weed, it may cause an allergic reaction like itching and irritation of the skin in people who are sensitive to ragweed plants and its likes. Sambong extracts also possess many medicinal properties and are believed to be antifungal, antibacterial along with being an astringent and providing relief from rheumatism. The full nature and benefits of this herb are yet to be uncovered; it will require additional studies and tests to understand the full potency of this herb and how it plays a role in looking after the human body and mind.